While every animal is different, there are general guidelines to determine when they become “senior citizens.” Cats are considered mature at 7 to 10 years, senior at 11 to 14 years, and geriatric at 15 or older. Dogs, in general, may be called senior at 7 years of age, but larger dogs age more quickly. A Great Dane is a senior at 5 or 6, for example, but 7 is only middle age for a Chihuahua. Large breed dogs fall somewhere in between. A Golden Retriever might be considered senior by 8-10 years of age. 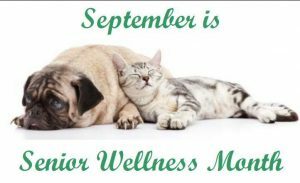 Ultimately your pet’s genetics, nutrition and environment will all play a role in determining when they are considered a senior. As pets age, their metabolism begins to slow. Unhealthy weight—whether that’s a weight below or above the ideal weight—is a common problem in older animals. This can cause older pets to be prone to diseases like cancers, diabetes and other ailments. Proper diet can help pet owners manage their pet’s weight. Our veterinary prescription diets include highly digestible protein sources and include important prebiotics to help with proper digestion. Muscle mass is important to protect in our ageing pets, so of course veterinary prescription diets have ingredients to help stimulate protein maintenance which helps to maintain muscle mass. Regular check-ups are essential to your pet’s health, and become even more important as your pet ages. Age-related diseases can be subtle, and symptoms may be easy to miss. Through regular exams and blood tests, our veterinarians can establish a baseline of what is normal for your pet. This will help alert you when something is not right. If you notice any changes in your pet’s behavior, appetite, or energy level, be sure to check with your veterinarian. Senior pets are should see a veterinarian every six months. Added supplements such as omega 3 fatty acids and glucosamine can help reduce the signs of arthritis and senility. Omega 3 fatty acids at therapeutic levels can help reduce inflammation all over the body, in joints as well as organs, which can help overall health and mobility. Glucosamine supplements help to rebuild vital cartilage (the rubbery tissue that cushions bones at the joints) which can help reduce the signs of arthritis in your mature pets. Many senior diets have these supplements added occasionally the level is sufficient for many senior pets, often senior pets will need more than is added into the diet. Mature pets can continue to enjoy high level of activity, although exercise periods and frequency should be closely monitored to reduce the risk of injury and stiffness. Exercise will help to maintain and build muscle to be able to achieve and improve on your pets healthy weight. Active pets enjoy a healthier life and this allows you to enjoy even more years of companionship. Heart, lungs and joints all benefit from moderate exercise. Many elderly dogs will try to keep up with you and won’t know they’ve reached their limit. Swimming can be a great low impact form of exercise for your senior dogs. While climbing stairs, playing with toys and chasing balls are all great activities for mature cats, exercise should be slowly increased if previously inactive. Provide your older pets with special accommodations too. For instance, pets with arthritis might benefit from soft bedding in the form of a special bed or towels/blankets to make a comfy bed. Ramps can be used to make stairs easier to navigate if they cannot be avoided. Even providing carpeting or rugs over hard-surface flooring can help your arthritic dog gain his footing and make it easier for him to get around. Moving your cats feeding station to a lower more accesable area such as the floor on the main level of the house. Conside the litterbox that you have in your house for your senior cats, a large step into the box could become painful to navigate. All pets, large and small, can experience wear and tear on their joints. However, your pet can’t tell you if his joints are stiff. Don’t assume that slowing down is an unavoidable sign of healthy aging. Signs of mobility problems can be subtle but monitoring your pets movements and over all activity can be the first sign there could be a problem. The absolute best way to prevent arthritis in dogs and cats is to keep your pet at a healthy weight. This will reduce the stress that the body places on joints and help keep things moving like they should. If you notice that your dog or cat has some “extra padding” around the ribs or belly then you should speak with your veterinarian to see if your pet is overweight. They will be able to help you with a weight loss plan and proper nutrition guide for your senior pet. Regular bloodwork can help to monitor your senior pets health in a more indepth method. Doing bloodwork allows our veterinarians to give you an over all assesment of yuor pets internal organs, such as the kidneys and liver. Your veterinarian will be able to help guide you into how to keep your pet healthy and happy for much longer, since certain medications should be avoided when there is an insuficiency with certain internal organs. Often times veterinarians are able to pick up on diseases earlier than your pet would be able to show symptoms, which is a major benefit to your pet.